Please note: The title of this book has changed to The Memory of After. Think of this place as a waiting room. Earth, what we call Level One, is about creating and forming memories. And this waiting room, Level Two, is about processing those memories, sifting through them to find the meaning of your time on earth. To come to terms with it so you can move on. Felicia Ward lived a tormented life on earth. Before she died, she had many shameful secrets she'd rather not relive. So when she ends up in Level Two -- a strange, white place full of hive-like structures that allow its inhabitants to plug in and relive memories of their life back on earth -- Felicia of course, chooses only to relive the happy times. But soon Julian, a boy she knew on earth, with secrets of his own, appears in her chamber, calling for her to join the rebellion against the Morati -- the angels responsible for imprisoning souls in Level Two and preventing them from moving on to the next level. Remembering how consorting with Julian back on earth led to the disgrace of her family, Felicia doesn't know whether she can trust him here in Level Two. But his promise to reunite her with her earthly boyfriend Neil has left her with no other choice than to join his fight. Told in a present-tense, first-person narrative as well as looking back at her past life through the memories Felicia watches in Level Two, Appelhans creates an engaging and highly original narrative that will leave you wondering: Will Julian and Felicia defeat the Morati? Will he fulfill his promise to Felicia? Or will he find another way to burn her the way he did back on earth? OK, I'm just going to get this technicality out of the way right now so you can make your own judgement about the reliability of this review: the author is a personal friend of mine. Many of you already know that before Lenore received her book deal through Simon & Schuster that she was a book blogger. I have been following her blog for a few years now and even visited her last summer when I vacationed in Europe (it's a tad bit serendipitous that I'm posting this review today since it was almost this exact time last year that I visited her). Perhaps many of you will feel as if this will cloud my judgement in writing this review since I consider her a friend, and perhaps unconsciously it does. But everything I am writing in this review is my true opinion. There is no sugarcoating here in order to spare the feelings of a friend. Everything I write is how I truly feel. Having said that, let me just amp this review right up with the superlatives: this is one of the most amazing novels I have ever read! Lenore has not only crafted an incredibly unique story in envisioning this white, Matrix-like place of Level Two, but she has also rooted it in theology and mythology. People have been categorizing this book as a dystopia, but that's a bit of a misnomer since the world Appelhans created isn't really a society in the human sense of the word. There are dystopian elements to it, yes, but I honestly see it more as a fantasy than sci-fi/dystopia. Even Lenore addresses this dystopia issue in a recent blog post. Lenore did an amazing job creating believable, complex, and interesting relationships among characters. Felicia's encounters with Julian leave you constantly wondering if he's the good guy or bad guy, her relationship with her father is endearing and helps the reader to see a softer side of her so we can get behind her, and her feelings for Neil genuinely evolve over to course of the novel (in her memories) rather than the irritating "insta-love" phenomenon that seems to be running rampant through YA these days. 2. The ending stands on its own yet still leaves room for the next installment. It is extremely irksome to me that so many YA trilogies are being written now as one continuous story rather than letting each book stand on its own. It's fine to read cliffhangers every once in a while, but to have that be "the thing" that all YA series writers seem to be doing gets tiresome. Level 2 not only stands on its own, but the ending has a perfect cadence. Yes, I want to read Level 3 (like RIGHT NOW!) 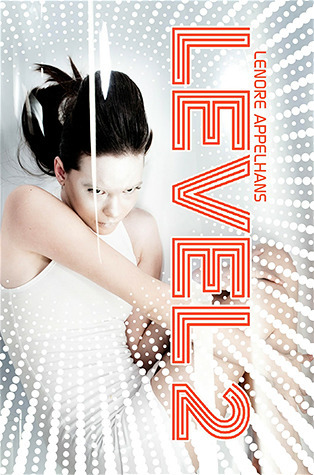 but I appreciate that Level 2 is a complete story in and of itself, which defies the trends (I'm someone who prefers originality to trendiness if you hadn't noticed). Julia Child once said, and I'm paraphrasing here, "People who love food are the best kind of people." I agree with said statement since I am a foodie after all, but I could also replace the word "food" for "words." I love people who love words, who relish in finding just the right word to make their sentences sing. People like John Green and Laini Taylor are writers I admire and whom I feel have mastered wordsmithing, who don't dumb down their writing for the sake of their teenage audience. And now I would put Lenore Appelhans into that category as well. Wordsmithing aside, however, the book also appeals to people who love action-packed plots with lots of vivid detail. The entire time I was reading all I kept thinking was what a mind-blowing movie it would make (sort of like the afterlife version of The Matrix). I've already mentioned this point, but it bears mentioning again. Never in a million years would I have pictured the afterlife to look like Level Two, and I'm sure most people wouldn't either, which is why, despite the initial doubt in believing that Level Two is a place where you could actually end up after you die, Lenore grounds her story in theological and mythological concepts (limbo, purgatory, fallen angels, the five rivers of Hades, etc.) to make it more believable. Quite ingenious. Since I know Lenore, I feel like this caused me to read with a more critical eye and I was hyper-aware of when things weren't adding up. Which is why I was amazed that every single time I would think to myself, "Well wait, how is that possible?" the question would always be answered later in the novel, sometimes even a few sentences later. I know this book has been hugely buzzed around the blogosphere because Lenore is a blogger herself, but after reading it and witnessing her brilliant creativity and originality, I can imagine WAY more people than bloggers will know her name come January. I'd be willing to bet on it. I am SO pumped for this novel! Great post! Fantastic review for what I'm sure is a wonderful book! I adore Lenore and am so excited to hear that her novel is so good. She deserves the best!